Like a conventional hi-fi system that had shrunk in the wash, each component used standard RCA type connectors at normal signal levels and was powered directly from the mains by its own built-in transformer. 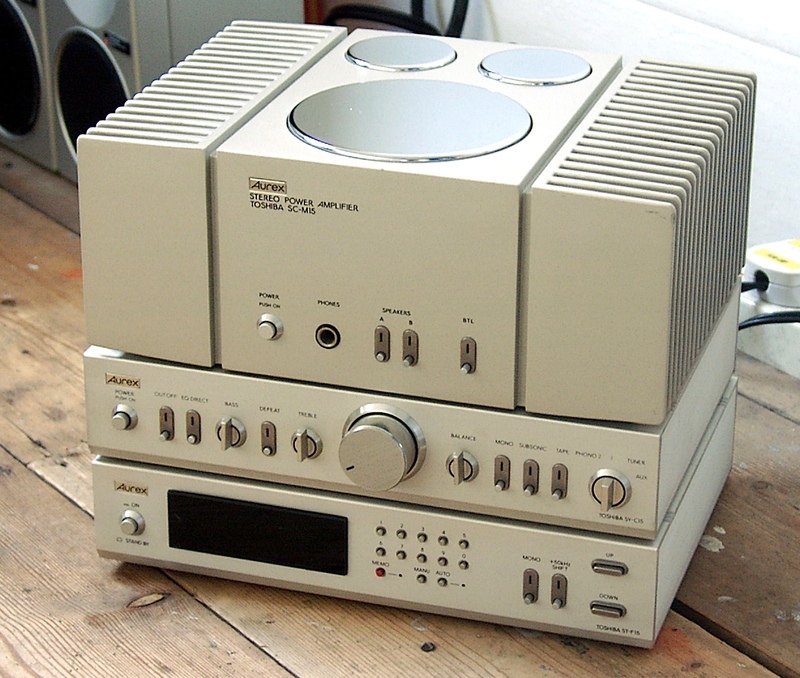 This meant you needed lots of mains sockets if you had the full cassette deck, tuner, preamp and power amplifier – which was a chore – but it also meant that like full-size separates you could chop and change components. This appealed to hi-fi buffs, and often you would find customers mixing the different 10, 12 and 15 series to their taste and budget. More fun could be had from the AT-12 quartz clock and timer which came in a cabinet that matched the rest of the stack. There was a choice of amplification; the SB-A10 integrated offered 20W per side, and then there were the the SY-C12 preamplifier and matching SC-M12 power amp (giving 45W RMS per channel), twin tape loops, an auxiliary socket for your CD player and a decent MM phono stage. The high end SY-C15 preamp and SC-M15 power amp combo gave a similar power output but from discrete transistors rather than chip modules. They were all well made with short signal paths, decent components and neat internal layout. The cassette decks were also fine designs, with the PC-D12 offering LED meters, metal tape and a fine transport using two motors and IC logic control – a key refinement over the rival Aiwa. Oddly, considering Aurex was a champion of the format, there was no ADRES noise reduction – this was Toshiba’s own system, and it claimed it was better than Dolby B – this suggests Aurex had the mass market in mind when it designed its micro cassette decks. Still, there was the matching external AD-15 ADRES processor, if you were a real purist! All Aurex micro-components sounded very good, with the pre-power based systems in particular being able to offer sonics on a par with a decent Japanese entry-level full size rack system. Considering the dinky dimensions, this was an amazing feat – especially for the late nineteen seventies when miniaturisation was a far less well worn path in audio. Generally the Aurex microsystems sound clean, detailed, surprisingly powerful and lively and nicely musical – they give a level of involvement which simply wasn’t expected from separates of this size. And there are no nasties either, as the sound is decently smooth and even the cassette decks sound impressively stable. These days, Aurex micro components pop up secondhand surprisingly often, meaning prices aren’t prohibitive. If you’re looking for a great second system, then look no further – here’s one hi-fi marque that proves less is more! Has anyone got a fully serviceable AUREX stereo preamplifier model SY-C12 for sale please? I have just posted it in the Facebook Marketplace. I am in Honolulu. I have a complete system, speakers included, all original, cassette deck works perfect, first ownwe from 1980. In Buenos Aires. Hi, has anyone got the AT-12 Clock? Or any deck with metal capability, which from what I can read, is the 12 and 15. Thanks.